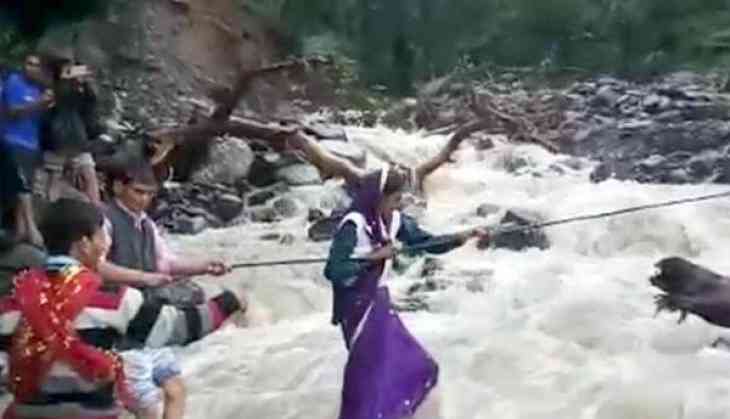 After torrential rains in the region washed away the only bridge built on a river two months back, the locals of a village in Uttarakhand's Chamoli are forced to use a rope to cross the river, even when the water current is high. Villagers have tied a rope at banks of both sides of the river, which they use as a support to walk through the water. This temporary arrangement is putting the lives of locals at risk and was put in place two months ago after the bridge got washed away. However, Chamoli District Magistrate Swati Bhadoria said the village administration has been directed to build a bridge at the earliest. "We have ordered village administration to construct a new bridge at the earliest. For now, a temporary arrangement can be made for the village and a proper bridge will be constructed after the rainy season," she told ANI. A similar case highlighting the lack of adequate infrastructure in the district came to light nearly two months ago, where students were seen using a rope ladder to climb a hillock to go to school.